I’ve gone back and forth and back again on how best to approach this portion of the chapter. Due to re-writes and editting, I’ll have to replace about three weeks worth of comics (not already-posted comics, comics I had created in advance beyond the current ones). I’ll be working with a buffer of 1, if that, for the next few weeks thanks to some behind the scenes rewrites. Up to now I’ve had the comfort of a safety net in the form of a three-week comic buffer, but now I’m diving head first into the trial by fire of posting the comics practically as I make them, all because I had some ideas pop into my head of how to better present the final scenes of this chapter. -EDIT- I was going through my daily webcomics routine, and apparently the final installments of The Phoenix Requiem aired today. If you’ve never read Phoenix Requiem, it’s a gorgeous and wonderful narrative webcomic that updated for several years, and since it is now completed you can read the entire story beginning to end. One day I hope I can digital paint as wonderfully as Sarah Ellerton. Oh dear. Well, it’s a good thing she hasn’t had dinner yet. I guess being in a sheltered home where everyone knew the score, Selkie never learned to express WHY she can’t eat certain things. My sister, by the time she was 3, knew exactly what she was and wasn’t allowed to eat and how to pronounce “allergic”. Yay, I beat the rush! I suppose there was a good thing in missing Monday’s update by accident after all. Anyway, hello Dave. I’ve been reading the comic since about last month, and I must say, you have something very interesting on hand. It shows from all of the extras and note comments you leave that you have been working on this project for quite some time, and I’m very respectful of authors who have done pre-planning. Being a new writer myself and a bit of a perfectionist, I’m just in the starting stages of several story projects, some comic based and some not. I haven’t seriously begun on any one thing, but reading the works of others always serves as an inspiration to me. To be honest though, I’ve been a bit disappointed by the recent run of strips involving Todd’s parents, but I think that’s more a case of me catching up to the end of the buffer than any weakening of the writing itself. Both of them definitely have personalities that aren’t flat or wooden and are totally capable of being built on in the future. Maybe it’s just the lack of action giving way to exposition? If it is, it doesn’t feel forced in the least, so there’s another thumbs up for you good sir. I’ll part by saying that I hope you can stick to schedule and not fall prey to that dreaded “update bug” that hits so many other authors. You’ve got talent Dave. It’d be a shame for it to go to waste. Wow, thank you1 I never thought of the comic as an “inspiration” before. 😀 Best of luck with your own writing endeavors. 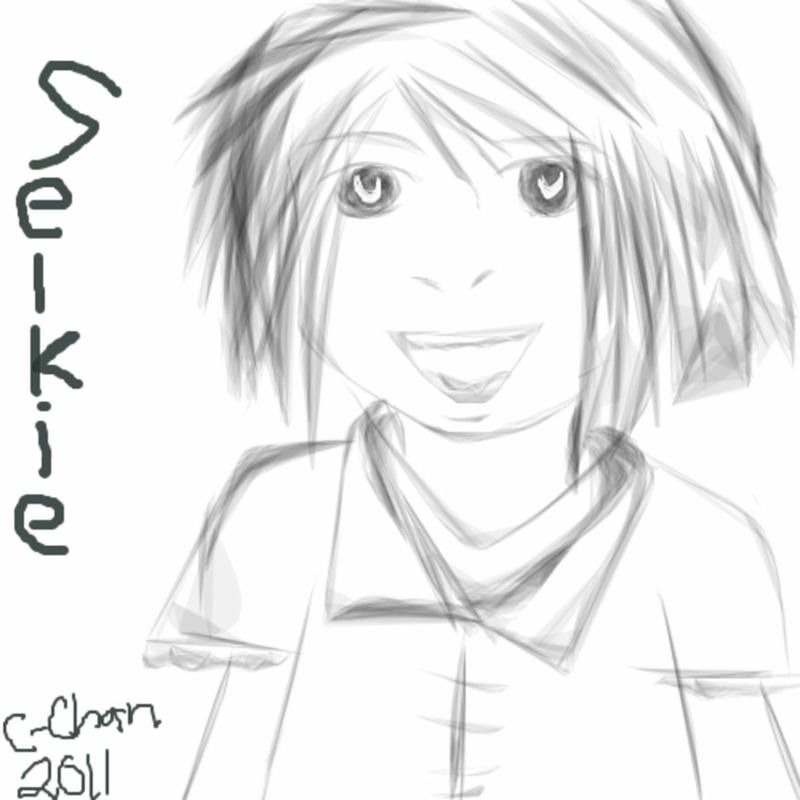 And if I have anything to say about it, missed updates will be unheard of at selkiecomic.com. Rawr! Grandma’s shoes may be targets; Selkie isn’t looking well in that last panel. I hope her allergic reaction is no more serious than an unhappy tummy for an hour or so. At least she didn’t eat the whole thing. Perhaps spit it out and holding it in her hand in panels 3, 4, and 5? Dave> Ah, yes:) With Shards, sometimes the webcomic is ahead and posted by a few strips, other times it is done the day or a few days before it is posted. I’m glad I have my husband to preview it most days to check for mistakes and corrections. I have had to fix several dialogues from what he says they should be. This is of course after I’ve gone over it with him while drawing it or even before but he changes his mind at times LOL. And sometimes, because Shards is so involved and has little details all over, I lose track of one or two. I’m always the one to spot something not shaded right, however:) I feel yer pain. Shouldn’t she know better than to eat plant things? She told Todd she couldn’t eat plants, what stopped her from telling Grandma? I have an explanation for it in the next comic, although I admit this is probably something I should have done a thought bubble for (I try to avoid thought bubbles, generally). Basically, Grandma’s “think of it as an eyeball” comment was interpreted as “it tastes just like fish eyes”, plus there’s also the “peer pressure” aspect of a child being convinced by an adult to eat the item. Todd never tried to force the issue, but Grandma is in “resistant kid” mode and being a little pushy. In their defense, they raised 3 kids. Those little poop factories will lie about anything. That’s the problem, assuming anything a child says is a lie. Believing that is a great way to teach the kid to never bother to tell you anything at all. I’m not saying that you should never believe your child. Just that, when it comes to food, unless a doctor tells you the child is allergic to certain things or you observe that, say, kid + dairy = explosive diarrhea/hives, they are usually being picky. In general, you need to push children to try new foods and expand their horizons. Growing up, every single time I was dragged off to my grandparents’ house, I ended up eating a lot of baked sweet potatoes. Right from the start, I didn’t like them. Not one bit (it’s the consistancy, mainly), but I ate ’em, because neither parents nor grandparents would listen, and eating was easier than arguing over it. I still told them, every single time, that I didn’t like them. TWENTY FIVE YEARS LATER I AM STILL EXPLAINING THAT I DON’T LIKE SWEET POTATOES TO MY PARENTS. Somewhere along the line they suddenly decided I did like them, and didn’t remember a single complaint I had. This revelation was absolutely no surprise, as I had long since given up convincing them of anything whatsoever. Claim nutrition if you like. Doesn’t change the fact that you’re teaching the kid not to tell you anything. Growing up I hated cauliflower. Onions too. After I grew up and actually TRIED cauliflower … I found out I liked it after all. Discovered I liked onions too. Go figure. I actually like the bits with Todd’s parents. To each their own. 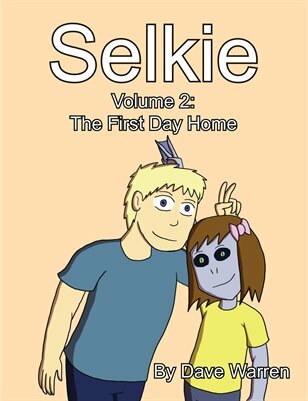 I just found your comic tonight from an ad on another comic I enjoy reading, I forget which, and I gotta say, Selkie has quickly been moved to my “top 10” webcomic folder, which is the first one I open in all tabs every day. I follow forty-odd webcomics, and what you’re doing her is something special. Hell, you’ve inspired me to do a fanart sometime soon. No comic has made me want to do that, ever. Somehow I’m thinking that this is something probably better said sooner than later. Assuming she is merely carnivorous, she’ll just puke it up and be fine (probably need some water, since she’ll taste bile + grape otherwise. )… I don’t know how Selkie herself works though. Since Selkie is fairly assertive for someone her age, I figured Todd’s Ma had probably gone into gentle-but-firm mode, as you said. She seems to have got the point now; part of the learning curve for her and Selkie. Poor grandma! She feels so terrible in that last panel. And she’s about to feel terribler … and feel a need to change her dress. Unless Selkie turns aside in time. Me either mostly. I think it gives her a rather severe look. But it is growing on me as I get used to it. I’d be cool with you taking a little time to catch up on comics and maybe have some guest comics after this arc is finished. I’m sure half o fthe people on here are dying to make a comic to show on here. You do know that the ‘interesting times’ line is a CURSE right? It’s one of a three-part Chinese curse: May you live in interesting times, may you come to the attention of those in authority, may you find what you’re looking for. All three things that you might think are good… until you really think about them. anyways… once upon a time I had 5 comics in the bank… things happened, now I’m down to 0! it’s really scary sometimes and some days it comes down to the wire on sunday night, but for the most part it gets done on time. try not to get tooooooo worried, but if you can get ahead, do it! it’s really nice having a few in the bank to fall back on! errr… at least it was. lol! Yeah. Who else sees that one happening? He handled it the best way for now. She has a special limited diet. Just about anything living in the oceans except maybe sea weed.